Francis Xavier was born in the Basque region of Spain and entered the University of Paris when he was seventeen. While there, he met Ignatius Loyola who repeated the words to him, "For what will it profit them if they gain the whole world but forfeit their life?” (Mt 16:26). Although Francis didn't immediately fall under the influence of Ignatius, he became one of a band of seven, the first Jesuits, who vowed themselves to God's service in 1534. Francis was ordained three years later and, in 1540, was appointed by St. Ignatius to the first missionary expedition of the young order. He sailed to Goa, on the west coast of India and, for the next ten years, labored to bring the faith to such widely scattered peoples as the Hindus, the Malayans, and the Japanese. Wherever he went, Francis lived with the poorest people, sharing their food and their living conditions and ministering to the poor and the sick, especially to lepers. He traveled thousands of miles to the most inaccessible of places under the most harrowing conditions, and converted hundreds of thousands. His missionary impact in the East has endured for centuries. 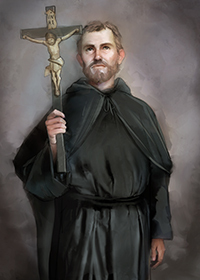 When missionaries returned to Japan in the nineteenth century after a gap of several hundred years, they found many Christians who were descendants of St. Francis’ converts. Indeed, with the possible exception of St. Paul, St. Francis Xavier was the greatest of all Christian missionaries. Appropriately, he is the patron of foreign missions. We celebrate the memorial for this saint on December 3. Francis’ message today: Although we are most likely not called to become missionaries in foreign lands, we can try to bring one person to Christ through our prayers and our example. We can also help the missions by financially contributing to the work of the priests, religious, and laypeople who are evangelizing throughout the world. Have you contributed in some way to the support of the missions? Also, pray that you might be a strong and good influence on one person’s life?